Skiing accidents, tree-trimming mishaps and hypothermia were all part of the imaginary carnage at a first Aid training session, designed to bring volunteers and teams safe in home and at the workplace. Twenty representatives from Mid North Non-Profits took part in the 12 hour course – spread over two days. The course was provided by Volunteering Northland and grants from Oxford Sport Trust and Pub Charities. Red Cross first aid training coordinator Kevin Spill said his organisation's aim was to get a first aider in every household in the country. “Most people end up doing the training through work – but the reality is, most accidents happen outside the workplace, at home,” he said. 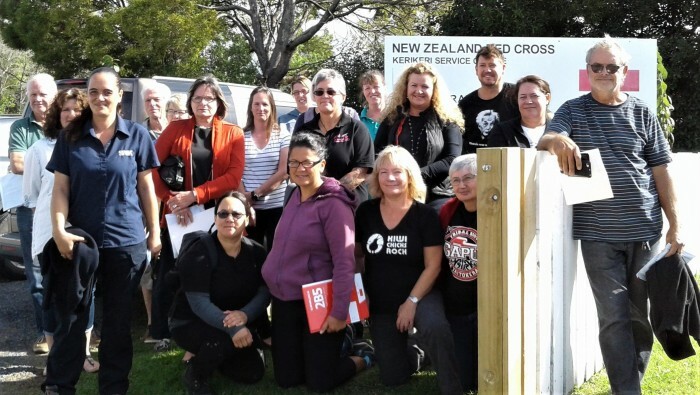 Volunteering Northland's Trish Clarke said the two day workshop filled quickly when advertised and the organisation is looking at hosting further courses in Kaitaia and Whangarei. Recent changes to the Health and Safety at Work Act highlighted the need for organisations to keep their teams and volunteers safe. “Many of the participants are from organisations that work with the public or host workshops, with some groups also out working in remote locations out in the environment,” Ms Clarke said. As well as recruiting and referring volunteers to a huge range of organisation across the district, Volunteering Northland provides training for volunteer coordinators, raising the professionalism in the sector. For details on how to become a volunteer or register and organisation to recruit volunteers, visit www.volunteeringnorthland.nz, 09 945 4984, or see the team at 71 Bank St.